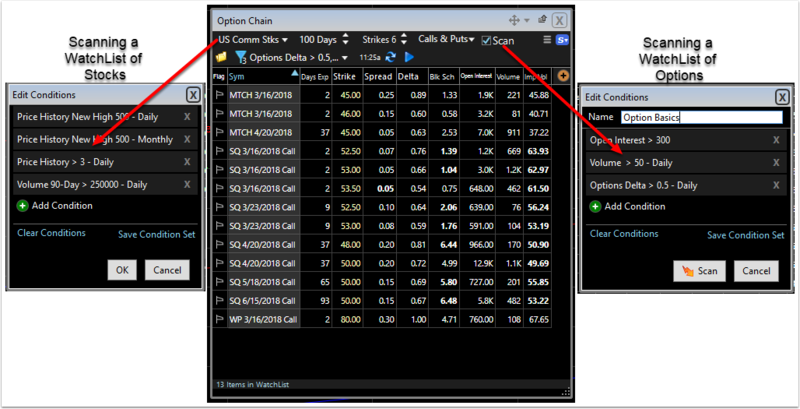 You can populate an Option Chain with options produced from a WatchList of stocks that have been scanned. 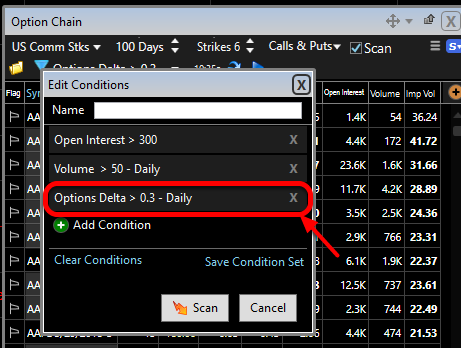 Then you can Scan those options using newly created or saved conditions. 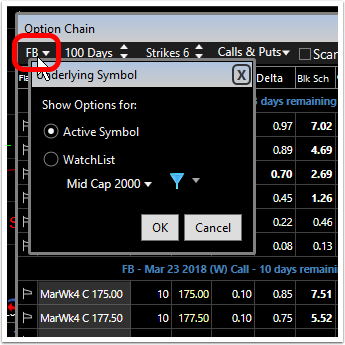 Steps to scanning both a WatchList of stocks and a WatchList of options in the same window are below. 2. 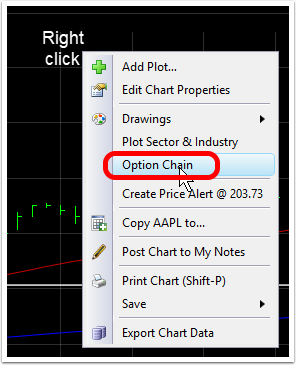 This will display the option chain for the current active symbol. In the Search field type the name of the condition(s) to be used for the Scan. 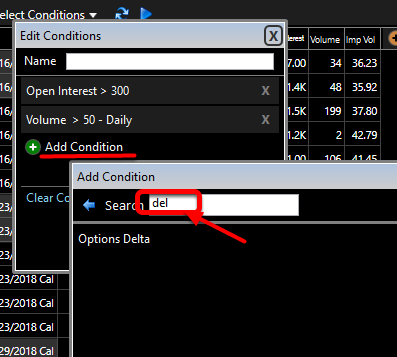 If you don't know the name of the condition(s) you can use the Categories to narrow the list and scroll to find the desired condition/condition set. 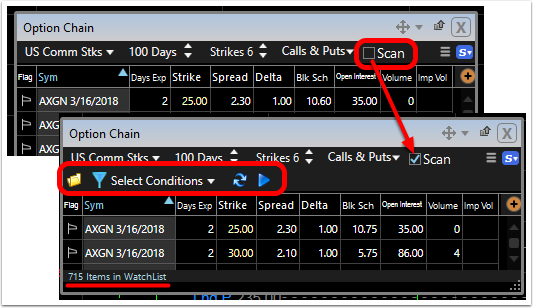 Click on the Condition/Condition Set name in the list to initiate the scan for the selected WatchList. 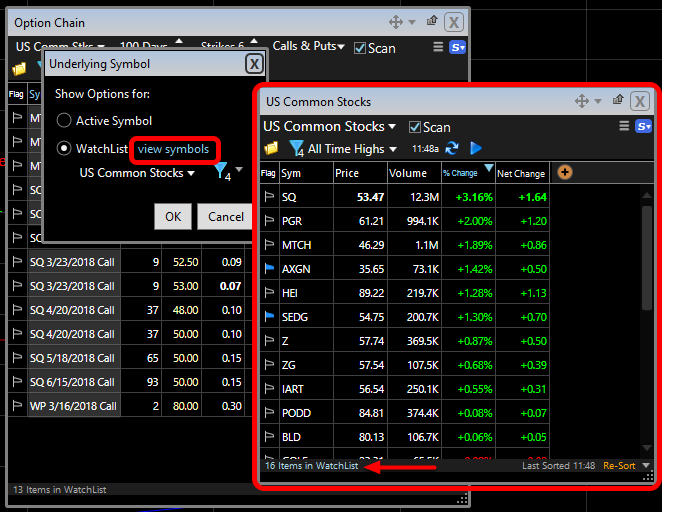 The total number of stocks found with the Scan conditions is always at the bottom of the WatchList window. 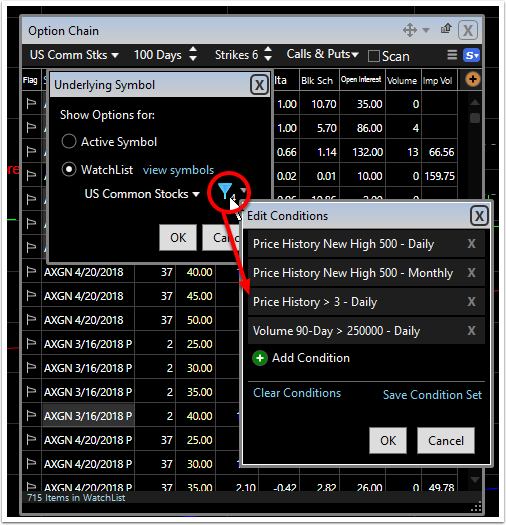 Click the Condition icon (blue funnel) to open the Condition Set. 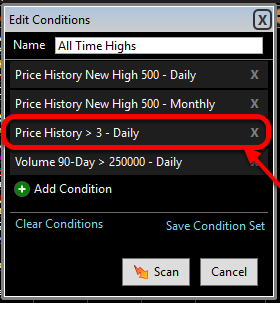 Change criteria settings in the Editor. Click OK when completed. 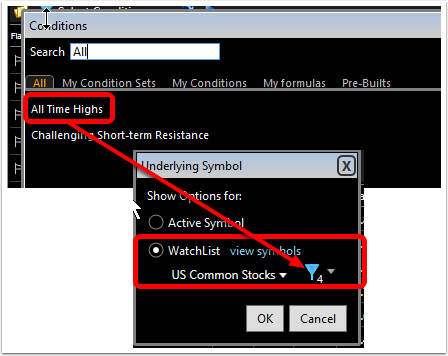 Click the WatchList dropdown menu to select a different WatchList. 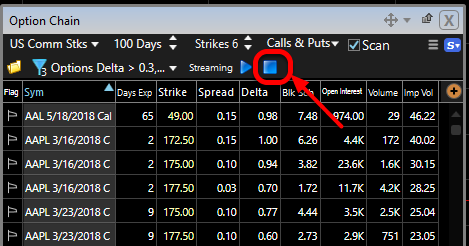 Click on the name of the desired WatchList to make it the active list being filtered by the Scan condition(s). 1. 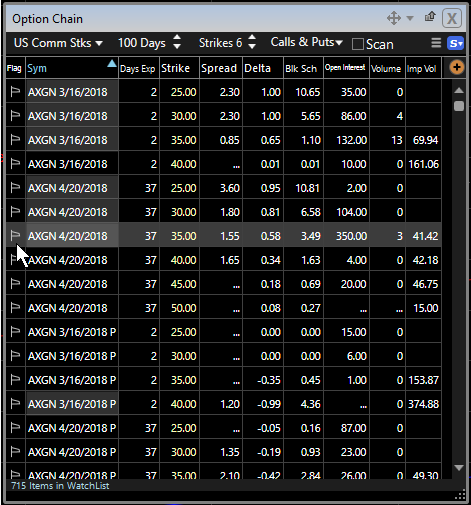 You now have the List of Options from the Scanned list of stocks (up to 10,000 Contracts maximum). 2. 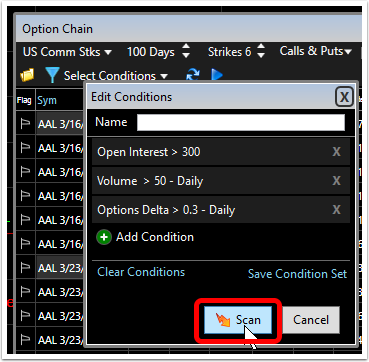 Place a Checkmark next to Scan in the Option Chain window (up to 10,000 options maximum). 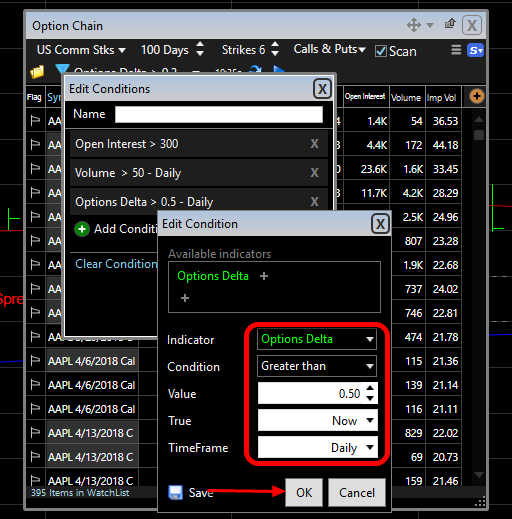 The number of options displayed can be seen at the bottom of the Option Chain. 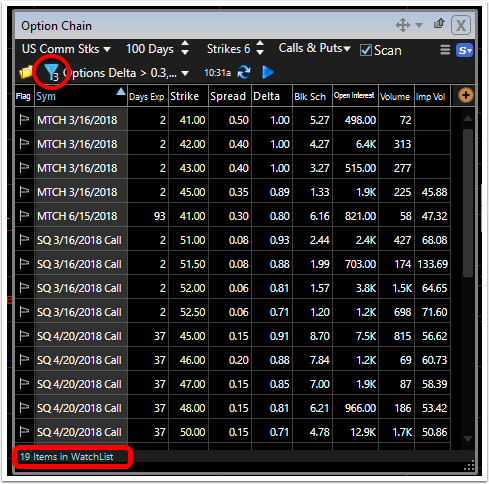 The options will be displayed on the basis of the criteria you have chosen in the option chain: Expiration dates; number of strikes; Calls & Puts. 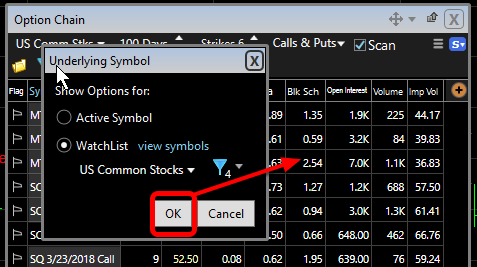 The checkmark activates the Scan menu from which conditions can be selected or created. 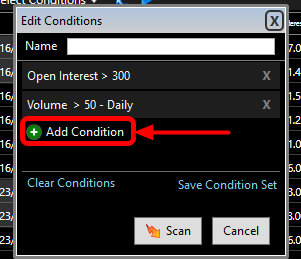 To create a new Condition/Condition Set open the Condition editor. 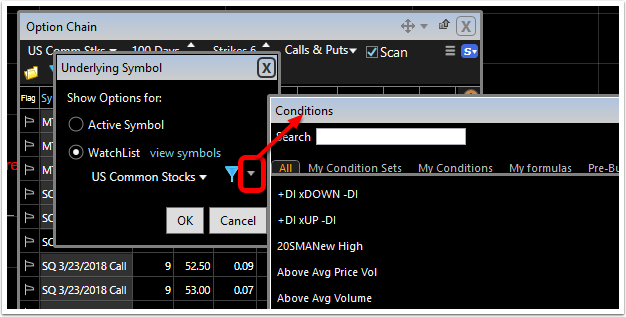 Note: to use scan criteria already created and saved, click the Folder icon to choose from the library. 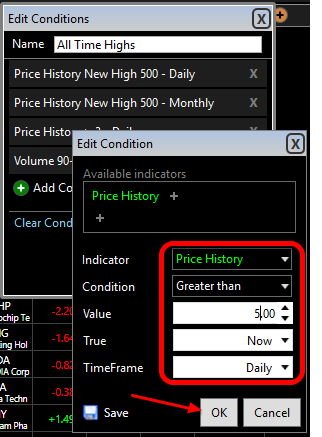 Click Add condition to open the criteria library from which the condition will be created. 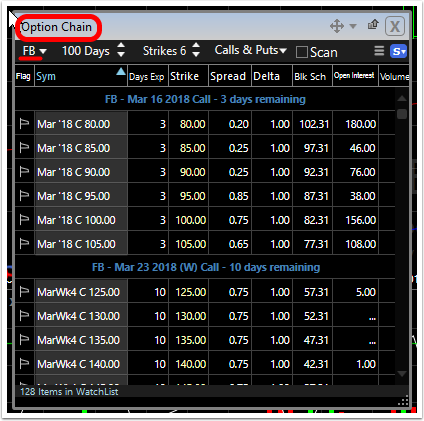 Click the criteria to be used for the condition. 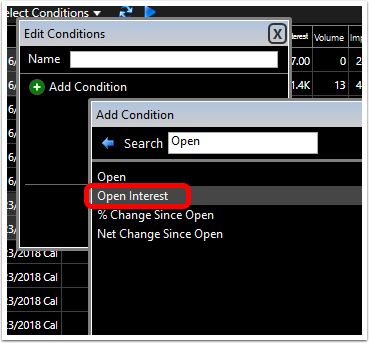 Note: In this example we will build a Condition set looking for options with Open Interest of greater than 300, daily volume of greater than 50 and Options Delta of at least .30. 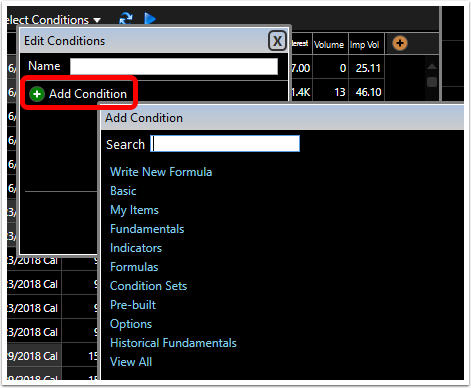 However, many indicators, options criteria, formula, etc., in the condition criteria library can be used for constructing a condition/condition set. 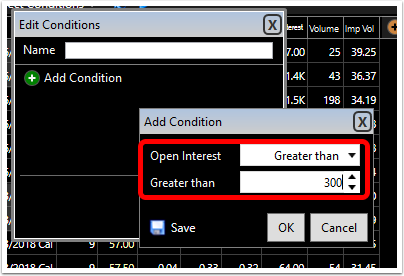 Note: when creating individual conditions, click the Save button to name and add them in the condition library for re-use. 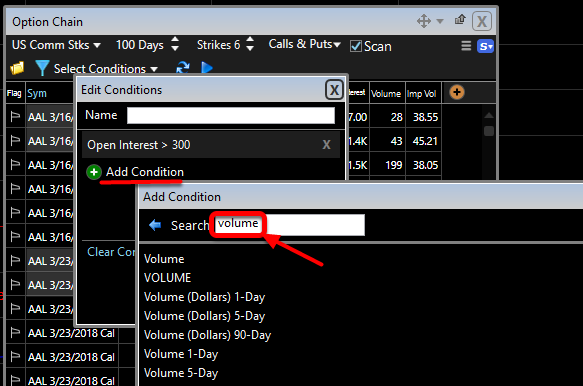 Use the typing shortcut in the Search field to type part of the word Volume. 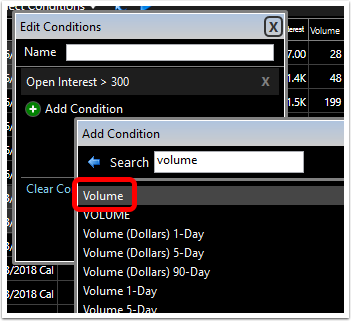 Select Volume from the list. 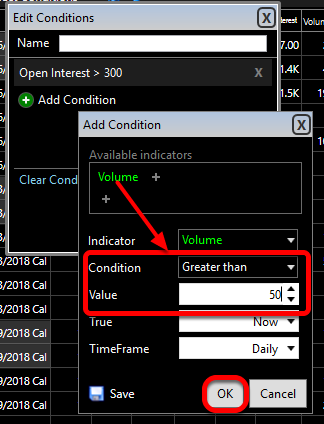 Set the Greater Than value to 50 and click OK. 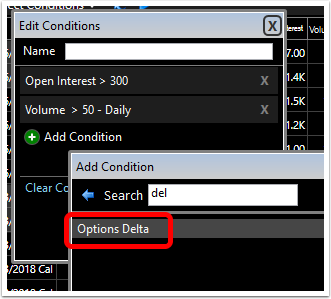 Select Options Delta from the list. 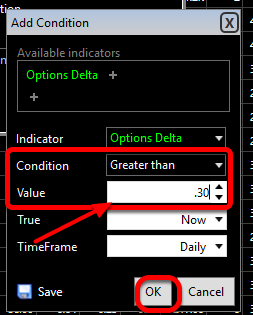 Set the Condition (Greater Than) value to .30 and click OK. 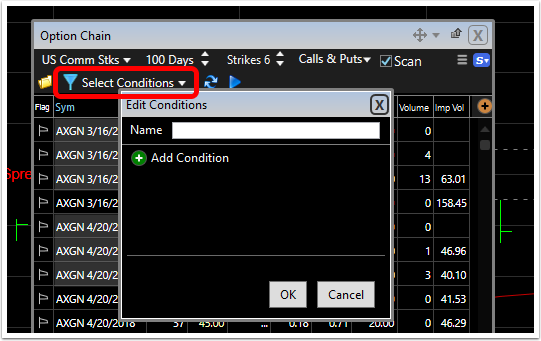 When constructing Condition Sets, click the Save Condition Set button to name and add the set to the Condition Set library for re-use. 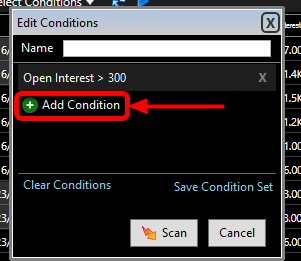 With the condition set complete, click the Scan button. 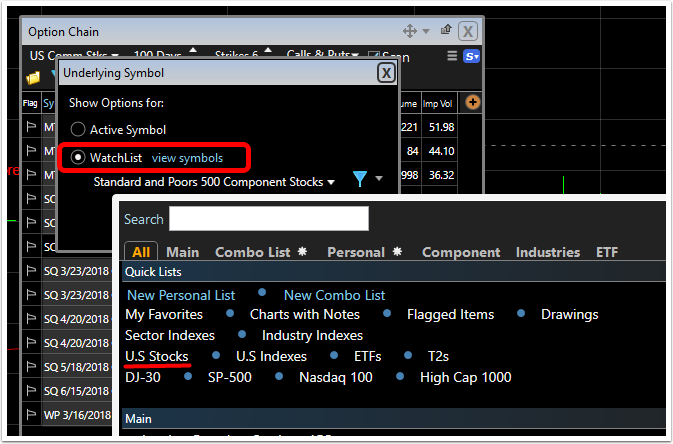 The resulting list of option symbols will meet all of the Conditions that were set as part of the Condition Set. The number next to the blue Funnel icon tells how many conditions are in the Condition Set. The time stamp next to Scanned shows when the Scan was last updated. To refresh the Scan results click the icon which looks like two arrows going in a circle. 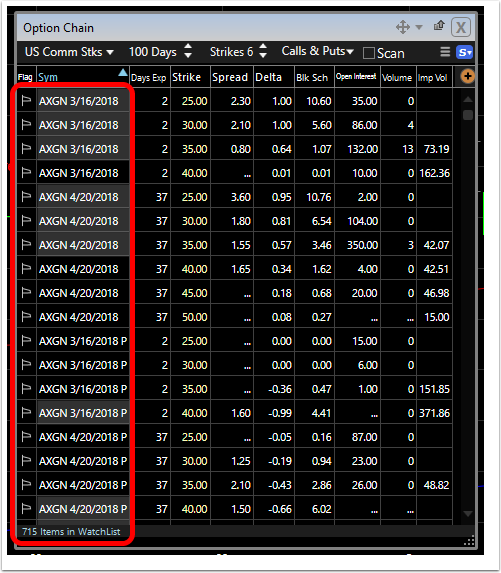 Streaming Scans: TC2000 Platinum users can Stream the Scan. This constantly and dynamically refreshes the Scan results in real time. To stream the Scan click the blue right facing triangle. To turn off a Streaming Scan click the Blue Square. 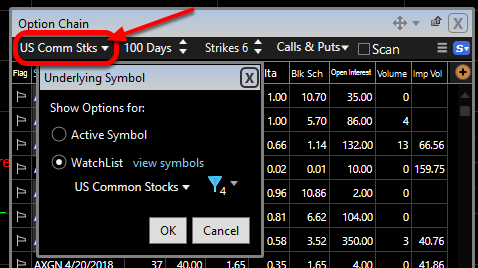 To apply the condition to any time frame, click the TimeFrame dropdown to choose the desired bar interval. Note: the conditions in this article are only examples. 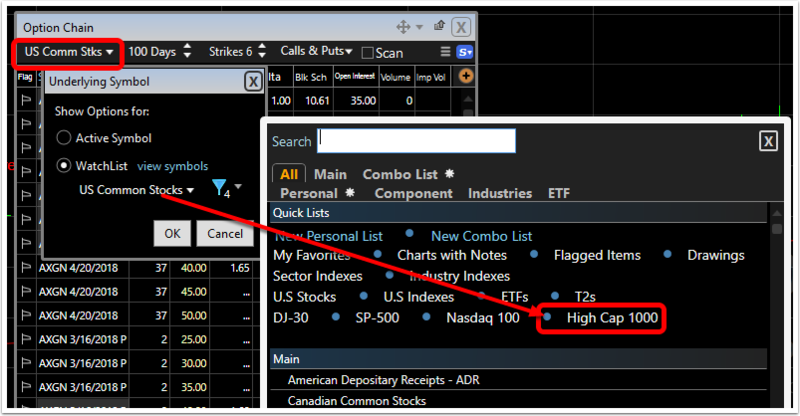 Any indicators, fundamentals, PCFs, etc., within TC2000 can be used in an EasyScan. 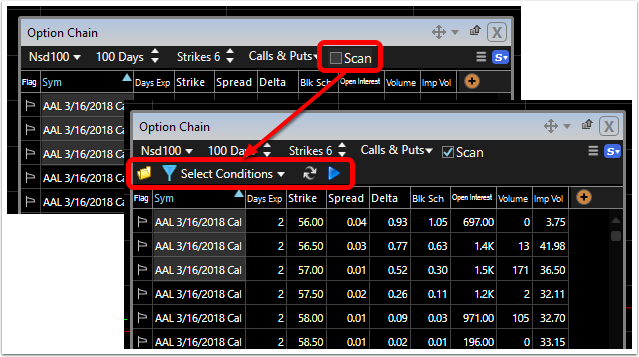 The conditions and results of the Scan examples should not be construed as a recommendation to buy or sell any security. They are presented solely for educational purposes.